Daily plots and raw data files, are available from June 20, 2007 to June 16, 2011. Solar Calendars, are available from June 2007 to June 2011. 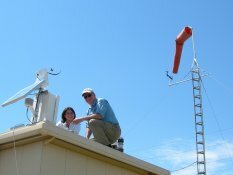 Wind roses (monthly, seasonal, & yearly) are available from June 2007 to June 2011. Pictures of instrumentation and tower at XECS site. June 21, 2007 Xcel Energy News Release regarding the RSR installation by NREL (20 KB PDF Document).